Preheat the oven to 180°C/360°F (convection). Melt the butter in a pot together with the sugar, water, and salt. Remove from the heat, and whisk in the flour. Return to the stove and whisk until the mass separates from the base of the pot. Set aside to cool down for a few minutes, then whisk in most of the eggs one-by-one until the batter is smooth. Fill batter in a piping bag with a star-shaped decorating tip. Pipe strips approx. 10-cm/4-in. on a baking sheet lined with parchment paper. Whisk the remaining egg and brush on. 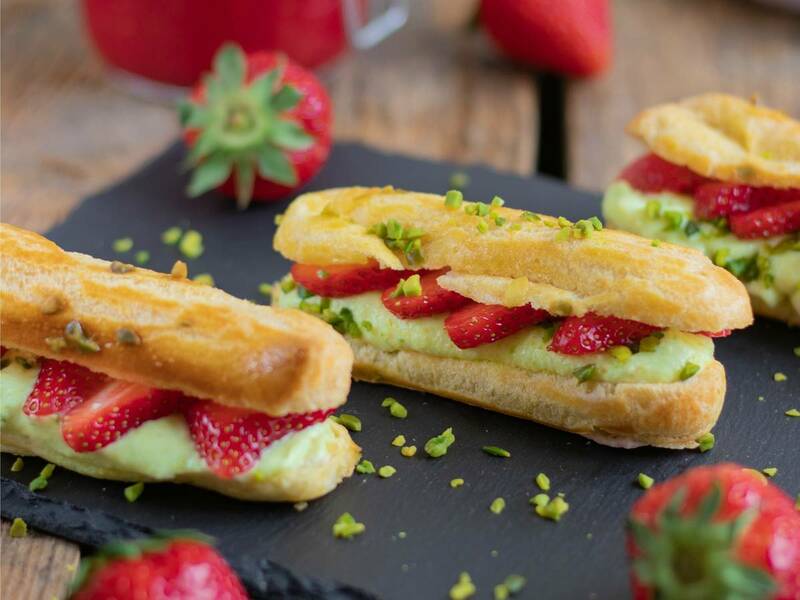 Sprinkle the chopped pistachios over the éclairs. Bake at 180°C/360°F (convection) for approx. 15 – 20 min. until lightly golden. Remove from the oven and immediately halve the éclairs horizontally. Set aside and let cool. Remove the shells of the pistachios and boil in water for approx. 5 min. Rinse with cold water and remove the brown skins. In a food processor, puree the pistachios, part of the heavy cream, the confectioner’s sugar, and vanilla sugar. Beat the remaining heavy cream and cream of tartar in a large bowl using a hand mixer. Fold in the pistachio puree. Fill the pistachio cream in a piping bag with a star-shaped decorating tip, then pipe on top of the éclair bases. Wash and slice the strawberries, then neatly arrange on top of the pistachio cream. Add the top halves of the éclairs. Refrigerate for approx. 1 hr. and enjoy!